Schematics are the basic building blocks of the electrical product. The electrical schematic is the symbolic definition of an electrical product. It explains in detail the functional potential of the product. An electrical product cannot do anything that the schematic doesn't allow. It defines the physical medium for electron flow, along with the means for controlling it. Schematics are building blocks, which is why the schematic design process begins with a simple block diagram. Blocks of thoughts or ideas are laid on paper and connected in a logical flow to produce the desired result. This is where most of the engineering creativity takes place for the physical hardware, and it's the most critical aspect. No matter what, if you need a function in your product and the schematic doesn't contain it, you will not get that function. Often what I do is provide extra circuitry in the schematic "just in case". Many times a customer wants only a certain function. But, many times another function might logically follow. Putting them in the schematic doesn't make the product more expensive, but it does make it more versatile. If you decide you want that additional function then it is much cheaper and faster down the road to make it happen. Though it's arguably the most important part, the schematic alone is not enough. 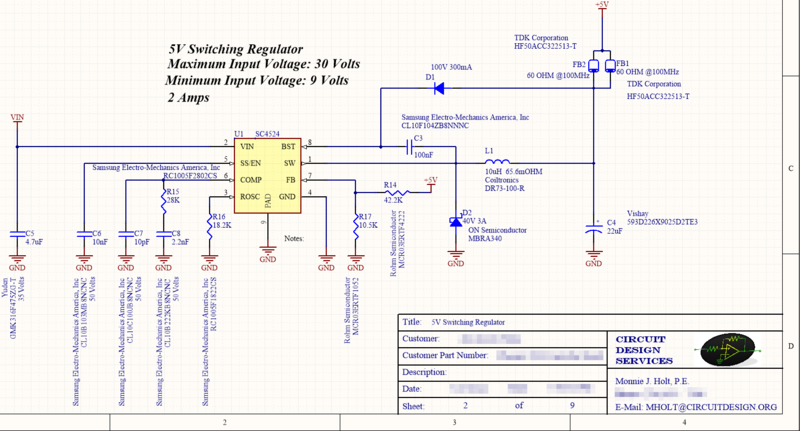 The next step in the electronic product design process is worst-case circuit analysis (WCCA). This example shows a 5 Volt regulator that can supply up to 2 Amps of current. It is essentially one block in a block diagram and shows all of the necessary components to create that block. Note that a schematic doesn't have to contain part numbers or even values for that matter. I typically add them for the manufacturer's benefit to help ensure they build the part correctly the first time.